The sizes we supply in white single wall include 4oz, 6oz, 8oz, 12oz, & 16oz. Double Wall sizes include 8oz, 12oz & 16oz. 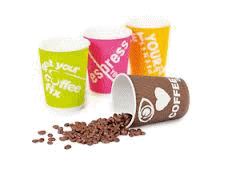 Our single wall coffee cups are alos made from a thicker 360gsm, as appose to the industry standard 320gsm cups to provide added insulation. If you require even more insulation, step up to the Double Wall cups.